The origin of blue jeans, though, is in the biography of a seventeen year old immigrant tailor named Levi Strauss. When Strauss arrived in San Francisco during the 1850s gold rush, he sold much needed canvas for tents and covered wagons. An astute observer, he soon realized that miners went through trousers quickly, so he stitched some up from his heavy-duty canvas. Although they were stiff and course, the pants held up so well that he became the go-to tailor. In the 1860s he replaced canvas with denim, a softer fabric milled in Nimes, France. Knownin France as the serge de Nimes, in America they called it denim. Strauss discovered that by dying the neutral colored denims to indigo blue hid the stains and made the pants more popular. Cowboys would soak the jeans in a watering trough and let them dry in the sun to shrink-dry them and make them fit more snugly. 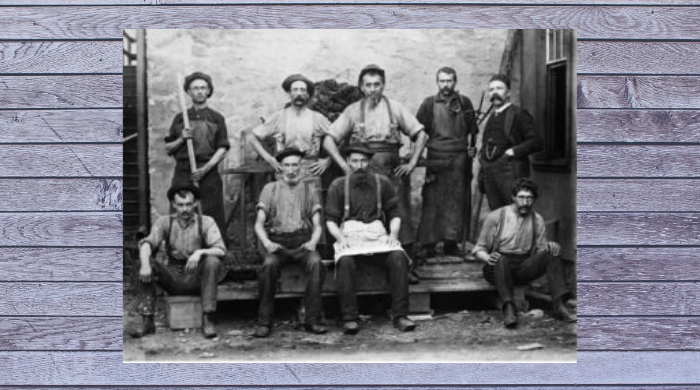 While denim pants resisted tearing, miners complained that the weight of tools often caused pockets to split at the seams. Strauss solved that problem by borrowing an idea from a Russian-Jewish tailor, Jacob Davis. In 1873, copper rivets appeared at each pocket seam, as well as one rivet at the base of the fly to prevent the crotch seam from opening when a miner squatted panning for gold. That crotch river, though, generated a different kind of complaint. Miners, unencumbered by the etiquette of underwear, found that squatting too near a campfire heated the river to give a painful burn. The crotch rivet was abandoned. Pocket rivets remained in place until 1937, when complaints of still a different nature were voiced. Children in many parts of the country rountinely wore jeans to school. And prinipals reported that back-pocket rivets were scratching and gouging wooden desks and benches beyond repair. Pocket rivets were abandoned. Blue jeans, strictly utilitarian, first became a fashion item in 1935. That year, an advertisement appeared in Vogue. It featured two society women in snug-fitting jeans, and it kicked off a trend named “western chic.” The fad was minor compared to the one that erupted out of the designer-jeans competition of the 1970s. The pants once intended for work became the costume of play, creating a multimillion-dollar industry. At the height of the designer-jeans war, Calvin Klein jeans, for instance, despite their high price of fifty dollars, or because of it, were selling at the rat of 250,000 pairs a week.